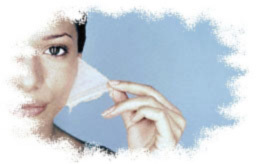 Chemical peeling, also known as chemexfoliation or derma-peeling, is a technique used to improve the appearance of the skin. In this treatment, a chemical solution is applied to the skin which causes it to "blister" and eventually peel off. The new, regenerated skin is usually smoother and less wrinkled than the old skin. The new skin is also temporarily more sensitive to the sun. We are using our own formulas for chemical peeling to guarantee you the maximum security and best results. A complete kit of topics will be offered to you to prepare and protect your skin after the peeling.